ESCC makes obtaining a quality higher education affordable for all students. Get started today on the education you need to start or advance your career at a highly competitive price. ESCC allows students to take their first steps toward a four-year degree in a welcoming, supportive environment. Complete your core, then transfer your credits to a four-year university. With programs preparing students for work in growing local industries, ESCC satisfies the labor needs of Wiregrass businesses, as well as those of students seeking good-paying, meaningful jobs. 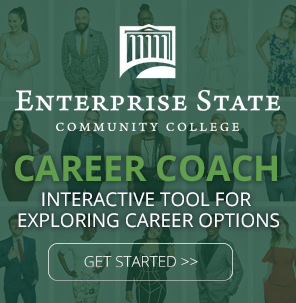 Enterprise State Community College offers excellent academic, technical, and workforce training programs in order to prepare students for jobs that are in demand. Our faculty and staff are committed to the educational success of all ESCC students. Grades Due – 12:00 p.m.
Grades Due – 10:00 a.m.